The LG V20 is the latest and greatest premium smartphone from LG Electronics, fitted with multimedia capabilities for consumers to create self-generated content through professional-grade visual and audio technology. The device is available in Australia from Tuesday 8th November 2016, at JB Hi-Fi stores for RRP $1099. When it comes to video, the user can record in crisp 4K resolution, plus the V20 features manual mode which gives the user the freedom to adjust settings such as white balance, manual focus and frame rates. Further convenience video features include Steady Record 2.0, which helps reduce shaky scenes to create a smoother recording. It works by using Electronic Image Stabilisation (EIS), which is built into Qualcomm® Snapdragon™ 820 processor and further uses digital image stabilisation (DIS) in post-processing. 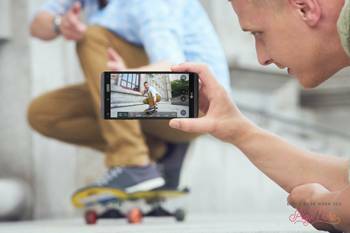 The LG V20 pairs high quality video with the same audio formatting used in professional video equipment, utilising 24-bit/48 kHz Linear Pulse Code Modulation (LPCM). In designing the LG V20 audio features, LG collaborated once again with renowned European audio brand Band & Olufen's PLAY brand, a diffusion line which focuses on portability and on the go audio solutions. The device is able to record Hi-Fi audio, providing high quality reproduction of sound to closely resemble the original source. It also supports optimal playback with Hi-Fi Quad DAC to help minimise distortion and background noise. Its HD Audio Recorder gives users the power to create quality recordings using three high Acoustic Overload Point (AOP) microphones to capture sound with a wider dynamic frequency range. This allows the V20 to handle much louder audio inputs than any other LG smartphone. Picture-taking has stepped up a notch with the LG V20, as it is armed with a front-facing wide angle 120-degree lens camera, meaning you can take endless selfies and fit a larger group of friends in. The rear camera also has wide-angle capabilities with a 135-degree lens to capture those dramatic Australian landscape scenes. The V20 also blends chic style with durability through the generous use of lightweight and strong AL6013 aluminium alloy. The V20 is equipped with Android 7.0 Nougat and a removable battery for added convenience. Other useful benefits include dual 3G/4G sim slots, as well as a separate expandable micro SD (up to 2TB) slot that can be used in conjunction with dual sim slots. Bruce Leigh, Marketing Manager for LG Mobile Australia comments: 'I'm hugely excited by our flagship LG V20 because access to high quality audio and filming capabilities via mobile should not be limited to professionals, particularly at a time when creating exciting and engaging content is a form of self-expression. LG understands this need, and has created our best ever device to allow our customers to take creativity into their own hands." Julian Kipping, General Manager at Bang & Olufsen Australia & New Zealand said: 'The LG V20 is the perfect device to house our signature Bang & Olufsen sound, reproducing high quality audio the way the artist intended. We are immensely proud to continue our partnership with LG Electronics latest smartphone release, which will provide a refined and detailed audio experience for its users."